Opening Up To New Perspectives: Art that encourages people to open up their perspectives and ways of viewing the world. 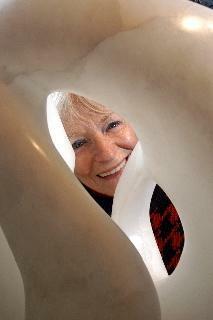 ‘Opening Up To New Perspectives’, is the title of a stone sculpture by resident sculptor, J. Ellen Austin and is a feature of this month’s exhibit. As an artist, J. Ellen appreciates that Art has the potential to provoke and challenge a viewer’s perspectives and ways of looking at the world. 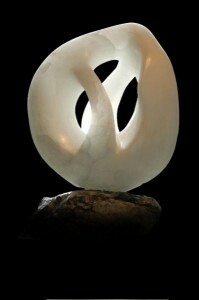 Italian translucent alabaster is a distinctive choice for an artist to open up and allow light to naturally shine through the stone. This particular stone inspired her to create a symbol of harmony and hope. She asserts that, “‘Opening Up To New Perspectives’ is something I have tried to do throughout my life, and I hope other artists and art appreciators might consider doing themselves.” She desired to create a sculpture that would encourage dialogue. Art that encourages people to open up their perspectives and ways of viewing the world. Allow yourself to open up to new perspectives. Join us this month at the JEGA Gallery. Be prepared for a bodacious mix of visual and contemporary art including: paintings, drawings, performance art and sculpture. 625 A Street an Art Triplex nestled in Ashland’s Historic RR District on the corner of 5th Street & A Street. By combining the serious with the sensuous or the oppositional with humor the Art at the JEGA Gallery has the potential to provoke and challenge the viewer’s perspectives and ways of looking at the world. As a working art studio, JEGA’s exhibits include a bodacious mix of visual and contemporary art. 621 A Street features resident artists Ann Disalvo and B. Allen Bayard. Disalvo works in mixed media, fluent in figures and landscapes. Bayard creates archival digital ink jet prints of electronic collages. Artist Demonstrations. 629 A Street WELCOME TO SHEPHERD’S DREAM! The Creators of Pure, Organic Wool Bedding for over 25 years is celebrating our grand opening a new showroom in Ashland.